Pear Tree Point School dedicated its new gym recently. On Dec. 1, the new state-of-the-arts gymnasium at Pear Tree Point School was dedicated to the memory of Jean Hilton. Hilton was the long-time director of the Plumfield School which occupied the PTPS property for more than six decades. Hilton was a committed educator of knowledge, wisdom and vitality who influenced and shaped generations of students and teachers. The inscription on the plaque that honors the occasion reads: "Dedicated to Jean Hilton whose spirit and passion for education inspires us every day." Among the honored guests at the dedication ceremony were Darien's first and second selectmen Jayme Stevenson and David Campbell, State Rep. Terrie Wood, the Hilton family and several former Plumfield faculty, PTPS founding headmistress Hazel Hobbs, along with current and former parent volunteers at the school and the attorneys, architects, engineers, AV specialist and the building team who worked on the gym construction. The new gym rose on the footprint of Plumfield School's 1931 open air athletic pavilion which segued in the 1970s into an enclosed structure over a dirt floor erected from an Agway kit. 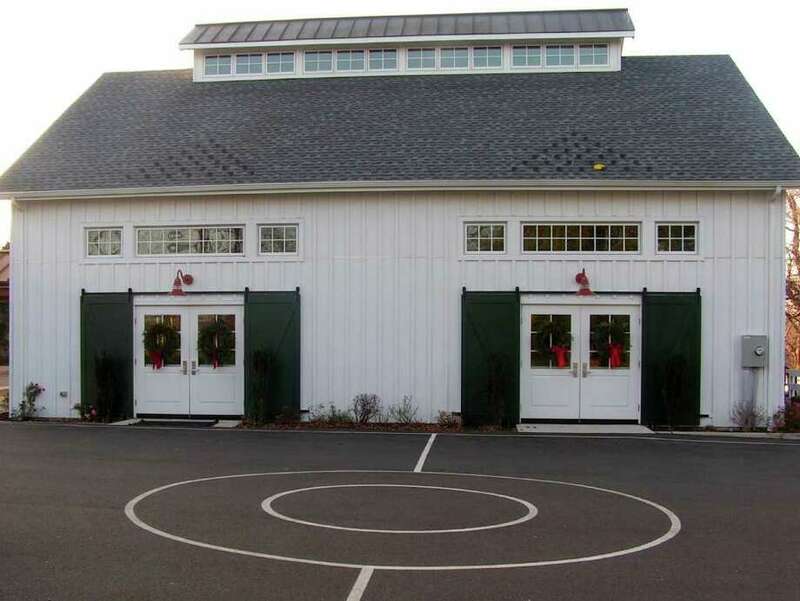 When Pear Tree Point School purchased the property in 1996, the gym got a facelift and a rubberized asphalt floor. However, by 2010, the gym had outlived its usefulness. Architects Eric Kaeyer, Lea Cromwell and their team of designers and engineers created a new vision of a gym modeled on a traditional New England barn. The new barn-like structure features a roofline with a row of clerestory windows providing diffused light and ventilation while within a cathedral-like ceiling displays arched beams. Heating and air-conditioning flow through suspended wall units while lighting, basketball hoops, fans and curtains can be adjusted from ground-level. "Our new gym is a place that will last a long time and be safe from stormy weather," a PTPS student said.